FAIMER is proud to announce the publication of a new book on community based education (CBE) authored by Wagdy Talaat, M.D., Ph.D., and Zahra Ladhani, Ph.D., both FAIMER faculty members and Fellows of the 2007 FAIMER Institute. 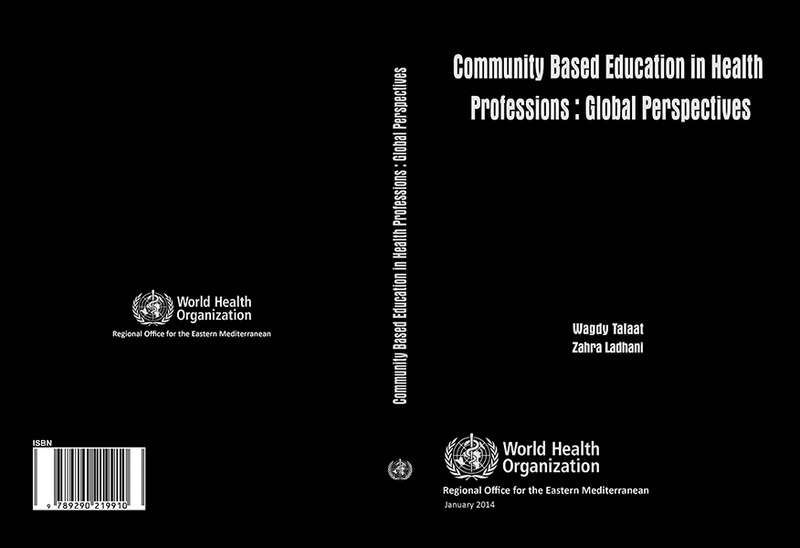 Titled Community Based Education in Health Professions: Global Perspectives, the book was published in January 2014 by the World Health Organization: Regional Office for the Eastern Mediterranean. To compile experiences of CBE, the authors invited contributions from health professions education institutions in six countries: Bangladesh, Brazil, Egypt, India, Pakistan, and South Africa. The selected institutions were invited to share stories about the implementation of CBE at their schools, to illustrate how different tools and approaches have worked in a variety of local circumstances. By documenting and sharing these varied experiences, the authors hope that their book will help guide and inspire other educators and community workers interested in implementing CBE programs. The book’s contributors include FAIMER Fellows Valdes Bollela (PHIL 2006) from Brazil, Dina El-Metwally (PHIL 2010) from Egypt, and Ben van Heerden (PHIL 2006) from South Africa. “The publication of this book marks a major collaborative project led by our Fellows,” says Page Morahan, Ph.D., Co-Director of the FAIMER Institute. To learn more about and/or access the book, click here. SEARAME NCHPE 2012 focused on working toward real and lasting improvements in health professions education for the Southeast Asia region and for India in particular. Among the many positive outcomes is a set of Conference Recommendations developed by participants and delivered to health professions colleges and appropriate government agencies throughout Southeast Asia. For more information on the conference, please visit the SEARAME NCHPE 2012 website. The International Center for Training in Medical Education and Distance Learning of the Medical Education Department, Faculty of Medicine, Suez Canal University (MED-FOM-SCU), in Ismailia, Egypt, in partnership with the Eastern Mediterranean Regional Office of the World Health Organization (WHO-EMRO), will soon offer a Distance Learning Diploma Program in Health Professions Education for speakers of Arabic. MED-FOM-SCU will administer the program, and WHO-EMRO will provide funding for development of a website for the program, including an online, distance learning “blackboard” interface, as well as funding for individual educators to participate. Registration is expected to open on December 1, 2011. FAIMER faculty member Wagdy Talaat (PHIL 2007), Professor and Head of MED-FOM-SCU and Senior Consultant to WHO-EMRO, is spearheading development of the Arabic program, which is an outgrowth of MED-FOM-SCU’s Diploma of Health Professions Education, a distance learning program conducted in English. The English program was established by Professor Talaat as part of his FAIMER educational innovation project, and it currently attracts more than 100 Egyptian health professions educators each year. Professor Talaat was also instrumental in the development of the Joint Master of Health Professions Education, which is offered by MED-FOM-SCU in collaboration with Maastricht University in the Netherlands, and the Joint Diploma of Health Professions Education by Distance Learning, a program that serves educators from Iraq and which is offered by MED-FOM-SCU in partnership with Lahaye University in the Netherlands. Professor Talaat mentions that there is still much work to be completed before the new Arabic program can be launched. In particular, course materials from the diploma program in English must be translated into Arabic, a challenging task that WHO-EMRO is managing. In addition, certain components of the program, such as case studies and examples, must be provided with an Arabic context to make them more relevant to participants. Despite these challenges, all parties eagerly anticipate launching on schedule. Professor Talaat in particular looks forward to sharing FAIMER’s mission and educational methods with an entirely new group of health professions educators in the Mediterranean Region. For more information on the program, e-mail medfomscu@yahoo.com. The FAIMER family was shocked and saddened recently by the death of Brazil-FAIMER Regional Institute faculty member and 2008 Fellow Regina Maria Lugarinho da Fonseca, M.D., M.Sc., Ph.D., after her struggle with a serious illness. Regina was Associate Professor of Genetics and Molecular Biology at the Universidade Federal do Rio de Janeiro, where she had served as Pro-Rector and as Vice-Rector. 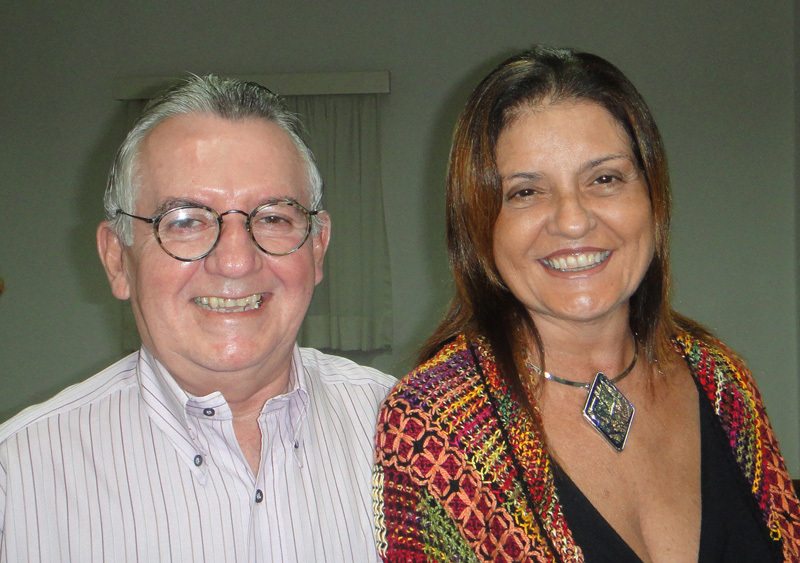 A prominent figure in health professions education in Brazil, Regina Lugarinho was in recent years Executive Director of both the Brazilian Association for Medical Education (ABEM) and the National Forum of Health Professions Education (FNEPAS). FAIMER extends its heartfelt condolences to Regina’s two sons, her family, and her friends. More than one-quarter of the projects awarded in the new Brazilian Ministry of Education Pro-Ensino (Pro-Teaching) project include Brazilian FAIMER community members as authors. This new program is intended to provide scholarships for health professionals to obtain master’s, Ph.D., and post-Ph.D. degrees in education, and to establish a new research agenda in education in Brazil under the auspices of CAPES (Coordination for Improvement of Superior Education Professionals, Ministry of Education). Of the 23 projects that were awarded, seven have FAIMER faculty or Fellows as heads or collaborators. These projects include Dr. Eliana Amaral’s (PHIL 2003) project on setting up a new graduate program focusing on the evaluation of educational programs and assessment of students as tools for improvement in health professions education; Eliana Goldfarb Cyrino’s (BRAZ 2007) project on integration of academics, health services, and community to create a new model for development of research; Izabel Coelho’s (BRAZ 2008) project on creating a medical education consortium for research among schools from Brazil’s South region; and Rosângela Cotta’s (BRAZ 2010) project on transformation of the teaching and learning processes in health professions education. Drs. Cotta and Cyrino conceptualized their Pro-Ensino proposals from their FAIMER education innovation projects. Also included among the projects are Brazil-FAIMER Regional Institute faculty member Luis Troncon’s project on higher education for health professions; Elizabeth Daher’s project on development of competencies in various scenarios of medical, dental, and nursing education: current status, and insertion and evaluation of active teaching methodologies; and Nilce Costa’s project on implementing a research area in the graduate education program in the health sciences at the Federal University of Goiás. Elizabeth Daher’s and Nilce Costa’s projects include FAIMER Fellows and/or faculty members as collaborators. Dr. Amaral, Co-Director of the Brazil-FAIMER Regional Institute, explains that the Pro-Ensino initiative complements a previously established program to which FAIMER Fellows and faculty made important contributions—the Professional Master’s on Education for Health Professionals, which aims to stimulate research among health workers from the National Health System. Both this program and Pro-Ensino are clear demonstration of the advancement of evidence-based health professions education in Brazil through the support of the government. The proportion of FAIMER Fellow awards in the Pro-Ensino program in particular is an indication of the impact that the Brazil-FAIMER Regional Institute is having on health professions education in that country.